It was 51 years ago, Thanksgiving in 1965, when an 18-year-old rising folk singer named Arlo Davy Guthrie drove up from Queens, N.Y., to Great Barrington to visit a friend named Alice Brock. While he was there, he did Alice and her husband, Ray, a favor. He took out their garbage. It would change his life. Guthrie and his buddy threw the garbage down a ditch where others often did the same thing. But the next day, Guthrie was arrested for littering, and that blip is what kept him from being drafted into the Vietnam War because he had an arrest record. It also became the narrative for a little ditty he wrote two years later that he called “Alice’s Restaurant Massacree.” Part song, part storytelling, it became Guthrie’s signature. You’ve heard the song, no doubt. So here are some fun facts, collected from interviews Guthrie has given and stories about the song over the years. The song is 18 minutes 34 seconds long, give or take a minute depending on his pace. The length of the song is the exact same length as the gap in the Nixon Watergate tapes, and Guthrie has often quipped that the song may explain that silence in the infamous tapes. The song was too long to be released on one side of a 45 rpm single. Guthrie had just started classes at Rocky Mountain College in Billings, Mont., in September 1965 when the incident happened over Thanksgiving break. He planned on studying forestry, but never finished his first year. He was born in Coney Island, N.Y., in 1947. He is one of four children born to Marjorie (Greenblatt) Mazia and folk legend Woody Guthrie. He was 13 when he gave his first public performance. In Boston, he was a regular performer at Club 47 in Harvard Square along with Joan Baez. Today Club 47 is Club Passim. In 1991, Guthrie purchased the Stockbridge Trinity Church where Alice and Ray Brock lived and where many of the events that inspired “Alice’s Restaurant” took place. Guthrie and his friend Ricky Robbins dumped the trash on that fateful day in Stockbridge because the Great Barrington dump was closed for the holiday. They were fined. And ordered to pick up their trash. The exact amount of the fine has varied in stories over the years from $20 to $25 to $50. The church is now The Guthrie Center, a nonprofit devoted to helping people with HIV and other afflictions, including Huntington’s disease, the illness that most contributed to Woody Guthrie’s death. One of Arlo Guthrie’s first lessons on the harmonica came from Bob Dylan, who visited his house looking for Woody. In the 1969 movie, “Alice’s Restaurant,” the cop is played by the real Officer Obie, William Obanhein, from the story. The blind judge in the movie “Alice’s Restaurant” is played by the real-life blind judge in Guthrie’s case, James Hannon. One of his inspirations for believing that such a long story could succeed as a song was Bill Cosby, whom he had seen tell long rambling tales on stage that kept audiences riveted. He has to relearn the song anytime he’s going to perform it. “It’s not like riding a bike,” he told Rolling Stone magazine. Guthrie’s biggest hit was “City of New Orleans.” “Alice’s Restaurant” never cracked the Billboard Hot 100. The album peaked at 17. Theresa’s Stockbridge Café is now in the space where Alice and Ray ran their restaurant. Alice and Ray Brock are divorced. Alice Brock owns an art studio in Provincetown, where she paints. Albert DeSalvo, the Boston Strangler, once wrote Alice Brock, she has said, asking if her restaurant would consider selling the choker necklaces he was making in prison. She declined. A version called “Alice’s Rock & Roll Restaurant” he released in 1969 lasts 4 minutes long and reached 97 on the Billboard singles chart. He does not listen to “Alice’s Restaurant” when it’s on the radio during Thanksgiving. And neither does his family. All of his children play instruments and sing, and some of his grandkids, too. Guthrie first performed live on a New York radio station in 1967. He rides a 2001 Indian motorcycle. The original lyrics contain a slur against homosexuals that today might bring a fine from the FCC to any radio station that plays a song containing it. But the song is played uncut and no fines are incurred. “Music will be your best friend.” This was a line his father told him when he was very young. One of Guthrie’s daughters, Sarah Lee Guthrie, is married to Johnny Irion, whose great uncle is John Steinbeck. His son, Abe, will play the keyboards on the upcoming tour with him. More than 75,000 photographs from Guthrie’s life have been collected for the tour and many of them will be projected on a screen throughout his concerts. When Guthrie was 18, he did his first concert with Pete Seeger at Carnegie Hall, a tradition they continued almost every year until Seeger died in 2014. One of Guthrie’s sisters, Cathy, died in a home fire when she was 4. The red VW microbus Guthrie talks about in “Alice’s Restaurant” has officially been “relegated to history,” according to a post on his Facebook page this summer. Woody Guthrie died in October 1967, only one month before his son released the song that would make him famous. His song “Massachusetts” was adopted by the state Legislature in 1981 as the state’s official folk song. 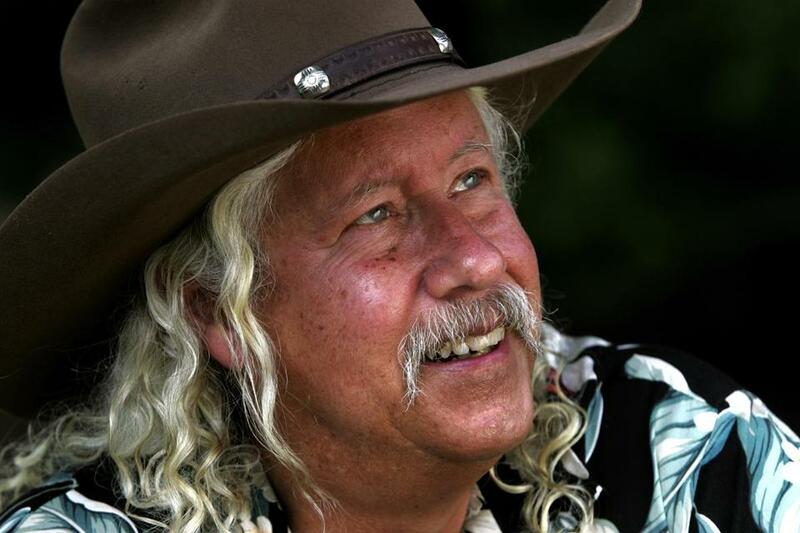 Arlo Guthrie’s music lineage goes beyond his father Woody. His grandfather Charlie was a court clerk in Oklahoma, a painter and a singer. His mother was a dance teacher at Indian Hill camp in Stockbridge. His father was Protestant, his mother was Jewish, and he was raised Orthodox. In 1977 he converted to Catholicism. His grandmother was a Yiddish poet named Aliza Greenblatt. He was taught Hebrew for his bar mitzvah by Meir Kahane, the controversial American-Israeli rabbi who later founded the Jewish Defense League and was assassinated in New York City in 1990. His full name has an unusual story. His mother read to him from a series of children’s books called “Arlo Books” about a Swiss boy named Arlo. But because she and Woody were concerned their son would hate the strange name growing up, they tacked on the middle name Davy, in case he preferred to use that. Davy was a nod to Davy Crockett. When he was in sixth grade, he walked into school and heard kids singing his father’s hit, “This Land Is Your Land,” and he realized he didn’t know the words. He quickly learned them.